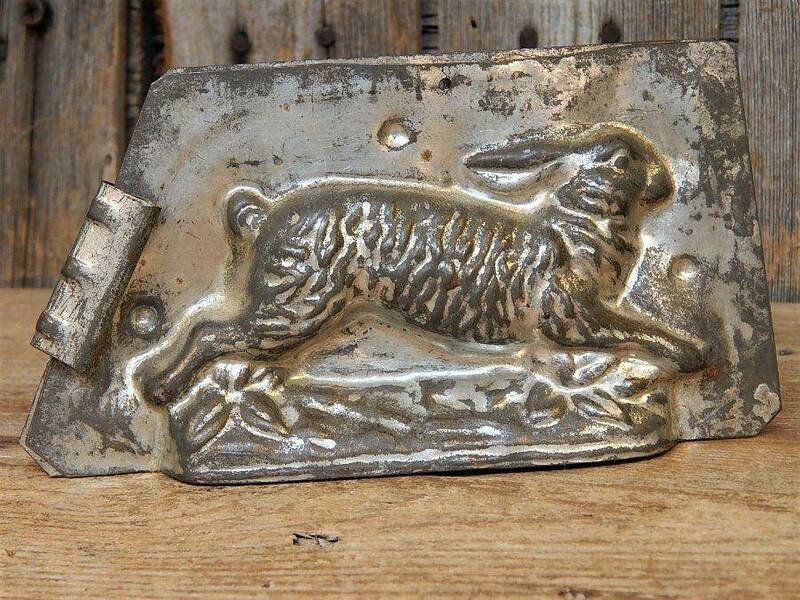 An antique tin Easter bunny rabbit chocolate candy mold sold for $52 in January 2019. How can we think of Easter without a chocolate bunny? Today, the foil-wrapped confections are mass-produced by the hundreds of thousands. But there was a time when they were handcrafted, using individual molds. And those original molds are now antique collectibles. 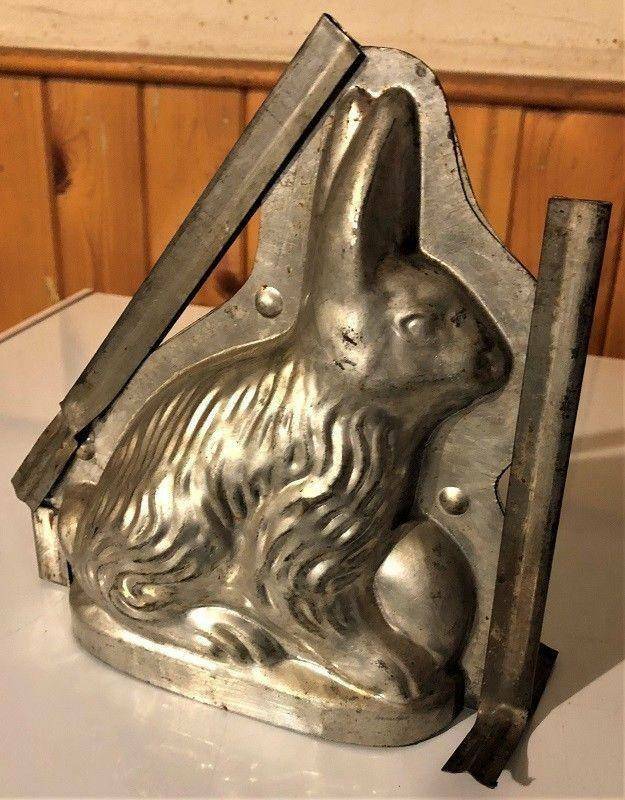 This antique German-made chocolate bunny mold sold for $110.50 in January 2019. Cocoa is believed to have first harvested in the Amazon more than 4,000 years ago and a bitter chocolate drink (mixed with vanilla and dried chilis) was enjoyed by the Mayans as early as 500 A.D. Spanish explorers brought cocoa beans back from the New World and the Spaniards mixed the drink with sugar in the 1500s to create a version of the sweetened liquid that we know today. It was not until the 1700s, however, that solid chocolate appeared—in Turin, Italy. 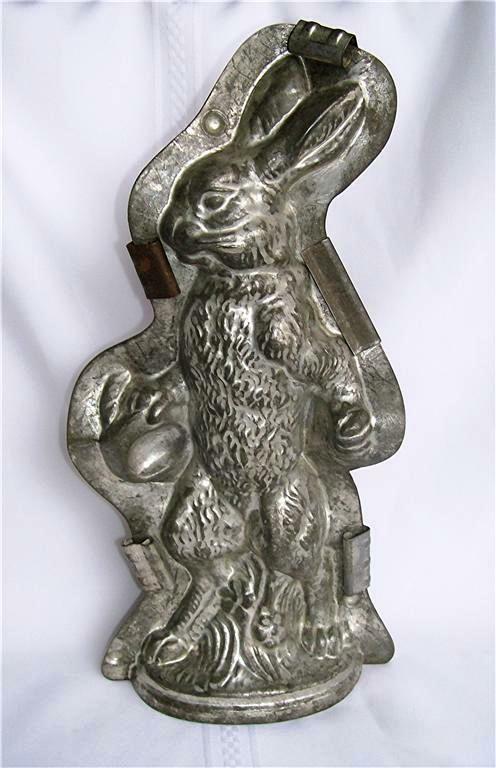 A 12-inch T. C. Weygant and Company mold of a rabbit holding his hat. This mold is noted for its fine detail. 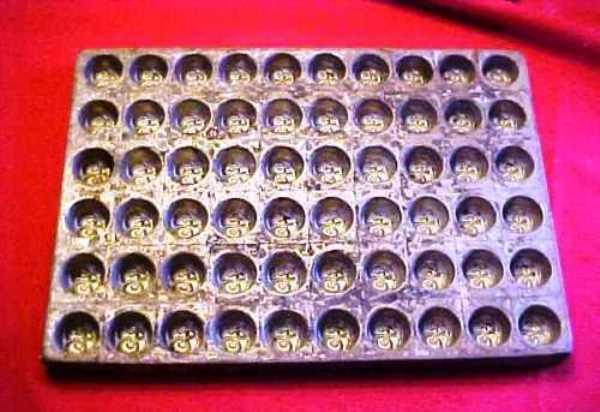 Around 1830, the first chocolate molds were created by pressing tin-coated metal sheets into various shapes. The molds were in the peak of their production between 1880 and 1940, particularly in Germany, France, and the United States. After World War II, the ease of mass-production replaced the artistry of individual candy makers and the molds fell out of favor. 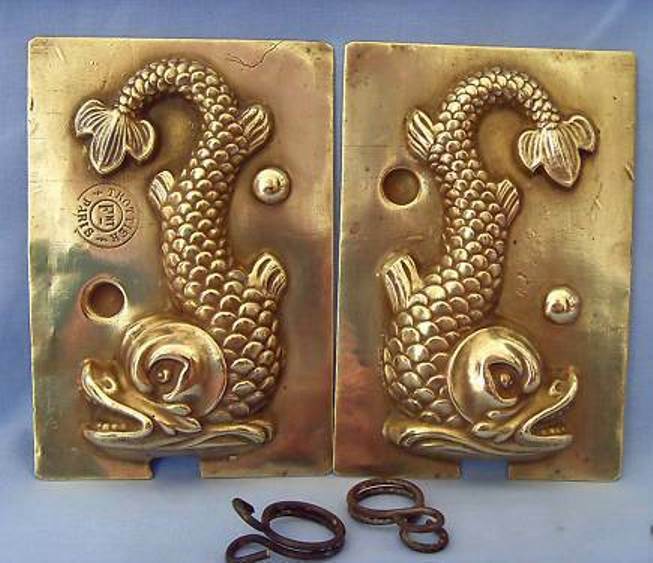 A rare 19th-century brass dolphin mold, manufactured by Charles Trottier of Paris. 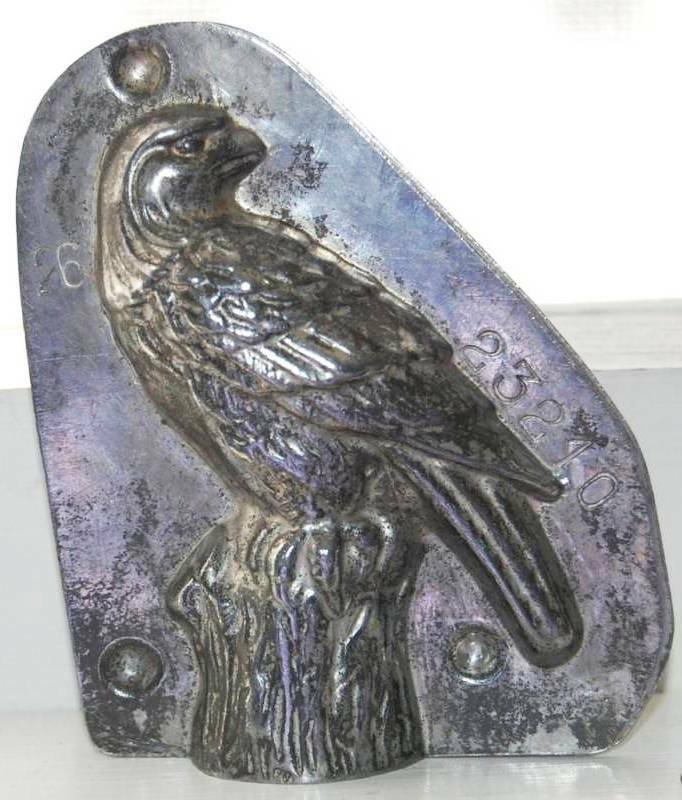 An Anton Reiche eagle from the 1920s. What makes a mold valuable? All of the parts must be present, including the locking mechanisms. Those with intricate detailing are valued higher and the ones stamped with the maker’s name or mark also bring higher prices. Some of the more famous early producers include Germany’s Hermann Walter (began production in 1866), Anton Reiche (began production in 1870) and Karl Dresden (who began in 1876). Unusual and rare shapes are always sought (because rabbits, Santas, snowmen, hearts, chicks and eggs are relatively common). Chocolate molds come in all shapes and sizes, so collectors can search the world over for unique versions of animals, buildings, flowers, story characters, dolls, baskets, ornaments and virtually anything else. In addition to an unlimited assortment of forms and figurines, the molds can also be grouped by style and composition. Molds come folded, framed, doubled or hinged. They can be made of heavy-gauge tin, copper, silver plate, pewter and nickel. And they can be locked with rings, clamps, clips, pins, straps, screws or rods. Rectangular block molds were also created to produce several smaller pieces at once. A varied collection can easily number in the hundreds. This block mold makes 60 one-sided cherries. Like almost all valued antique collectibles, the chocolate molds are also made new today. Some are advertised as reproductions, but they can end up in secondary markets where that designation is lost. How can you tell? Newer molds are much lighter and less detailed. They might be made of lighter grade tin or stainless steel and are usually not marked. And they will generally be shinier with a much younger patina. Liz Holderman is a Worthologist who specializes in collectible books, documents and autographs, and appraises collectibles.